Make no bones about it ... D1 Grand Prix is back in the USA!!! As the founder and premier drift racing sanctioning body globally, D1 Grand Prix (www.d1gp.com) is releasing the critical news the industry has been waiting for including: the 2009 U.S. racing schedule, locations, track design and upcoming media tour. D1GP USA made its first announcement regarding their return to U.S. soil just prior to the 2008 SEMA Show in Las Vegas. Since then, D1GP USA has been developing a new racing format and is excited to announce its 2009 racing schedule with four unique locations across the United States and an aggressive and high impact new track design. "With our new management team in place, we decided to focus all of our initial efforts on two main objectives. The first was to make the events more appealing and accessible to local, out of town and new entry level fans. The second was to deliver a new high impact state-of-the-art racing experience that will define the future of drift racing in the United States," said Rich Goodwin, President of D1USA. "In order to achieve these objectives we had to think outside the box. By moving the events to these centrally located venues allows for us to achieve our objective of making the events more appealing and accessible to fans, along with mainstream local media. In addition, the wide open spaces these venues offer also allow us to build in our aggressive new track design and to add in other exciting entertainment on and off the track." Dubbed the D1 Dojo, the new aggressive track design is more than a race track, it's a drifting entertainment experience that puts the show goer trackside for an up close and personal experience like never before. 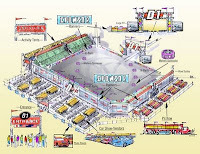 The track layout will be dynamic incorporating a bull ring-style with multiple entry and exit points and numerous turns. The racing will be heart pounding as in the distance fans will hear the faint roar of the engines as they ramp up from behind the Dojo before attacking the entry at top speed. The design allows for constant action -- as one car exits out of the Dojo from one side of the track, the next car enters simultaneously for continual racing action. During breaks the track will take on exhibitions and other racing elements to entertain the crowd and when night falls on the Elite 8, the Dojo will be transformed into a dazzling display of lighting effects that only Driven Events, made up of the original founders of Hot Import Nights could pull off. Surrounding the Dojo will be the D1 Fan Fest which will include sponsor and exhibitor midway, stage performances, model pavilions, car show and more. D1GP USA will release more entertainment and racing information in January to coincide with the launch of the new www.d1gp.com website and media tour. D1GP USA is operated by Southern California based, Driven Events. The company licensed the rights to D1 Grand Prix in the United States in late 2008 and they share a long term vision with D1GP Japan. Driven Events is made up of auto industry insiders. Led by Rich Goodwin and Michael Munar, the D1GP is under complete new management. Both Goodwin and Munar were the founders of the original Hot Import Nights (HIN) started in the late 90's. They sold HIN in 2004 and Goodwin and Munar went on to separate projects, however have now reunited specifically for this project. They are partnered with Ed and Emil Arguelles, the founders of Extreme Autofest. The group has also employed many of the original HIN & Autofest team who are now working to build one of the best new racing events in the U.S.
As part of D1GP USA's call to action, the new team will be conducting a media tour in January that opens up a new line of communication with the media. The goal of the tour is to simply introduce the entire D1GP USA management team to the endemic tuner publications, along with working to drive home the message that D1GP USA is here to stay. We will also be laying out more information on the strategic plans for D1GP, sponsors, drivers, venues and future plans for the business. I am so excited about this!!! !